Alvin Cullum York (December 13, 1887 – September 2, 1964) was a United States soldier, famous as a World War I hero. He was awarded the Medal of Honor for leading an attack on a German machine gun nest, taking 32 machine guns, killing 28 German soldiers, and capturing 132 others during the U.S.-led Meuse-Argonne Offensive in France. York kept a diary of his years just before the war and all during the war that became a movie script and became a classic Christian testimony of the struggle to follow God and to still obey the commandment, "thou shalt not kill." 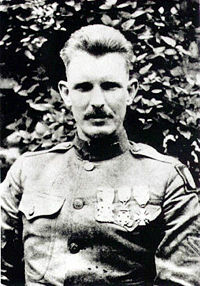 In October 2006, a group called the Sergeant York Discovery Expedition discovered the site where York made his heroic stand. Nineteen rusted Colt .45 cartridges buried in northeastern France along with 250 German machine gun casings, and other artifacts were found at the site in the Argonne forest near France's border with Belgium. On October 4, 2008, more than 600 Soldiers, family members, American Boy Scouts, and history enthusiasts from around the world joined with residents of Chatel-Chéhéry village and the French military to honor York with the official dedication of two monuments marking the site where he earned his decorations for valor. Claim of Appeal to being drafted for World War I for Alvin Cullum York. Alvin Cullum York was born to an impoverished farming family in Tennessee on December 13, 1887, the third of eleven children. When Alvin’s father died in 1911, he rejected his Christian upbringing and became a hard drinker. His mother, a member of a pacifist Christian denomination, tried to convince York to change his ways. Then during a night of heavy drinking when he and a friend got into a fight with other saloon patrons, York's friend was killed. The event shook York and after attending a revival meeting on January 1, 1915, he became a devout Christian. The revival he attended was presided over by Rev. H. H. Russell of the Church of Christ in Christian Union. A strict fundamentalist sect with a following limited to three states—Ohio, Kentucky, and Tennessee—the Church of Christ in Christian Union espoused a strict moral code which forbade drinking, dancing, movies, swimming, swearing, popular literature, and moral injunctions against violence and war. Though raised Methodist, York joined the Church of Christ in Christian Union and in the process convinced one of his best friends, Rosier Pile, to join as well. York became the song leader and a Sunday School teacher at the local church. Rosier Pile went on to become the church's pastor. The church also brought York in contact with the girl who would become his wife, Gracie Williams. "I wanted to follow both (the Bible and the U.S.). But I couldn’t. I wanted to do what was right…If I went away to war and fought and killed, according to the reading of my Bible, I weren’t a good Christian." York applied for Conscientious objector status, but his request was refused. York enlisted in the United States Army and served in Company G, 328th Infantry Regiment, 82nd Infantry Division at Camp Gordon, Georgia. Discussion of the Biblical stance on war with his company commander, Captain Edward Courtney Bullock Danforth (1894–1974) of Augusta, Georgia, and his Battalion Commander, Major Gonzalo Edward Buxton (1880–1949) of Providence, Rhode Island, eventually convinced York that warfare could be justified. But if the watchman sees the sword coming and does not blow the trumpet, and the people are not warned, and the sword comes and takes any person from among them, he is taken away in his iniquity; but his blood I will require at the watchman’s hand. With this, York stood up and said, "All right, I'm satisfied." The Germans got us, and they got us right smart. They just stopped us dead in our tracks. Their machine guns were up there on the heights overlooking us and well hidden, and we couldn’t tell for certain where the terrible heavy fire was coming from… And I'm telling you they were shooting straight. Our boys just went down like the long grass before the mowing machine at home. Our attack just faded out… And there we were, lying down, about halfway across [the valley] and those German machine guns and big shells getting us hard. York at the hill where his actions earned him the Medal of Honor three months after the end of World War I on February 7, 1919. Seventeen men under the command of Sergeant Bernard Early (which included York) infiltrated behind the German lines to take out the machine guns. The group worked their way behind the Germans and overran the headquarters of a German unit, capturing a large group of German soldiers who were preparing to counter-attack against the U.S. troops. Early’s men were contending with the prisoners when machine gun fire suddenly peppered the area, killing six Americans and wounding three others. The fire came from German machine guns on the ridge, which turned their weapons on the U.S. soldiers. The loss of the nine put Corporal York in charge of the seven remaining U.S. soldiers. As his men remained under cover, and guarding the prisoners, York worked his way into position to silence the German machine guns. And those machine guns were spitting fire and cutting down the undergrowth all around me something awful. And the Germans were yelling orders. You never heard such a racket in all of your life. I didn't have time to dodge behind a tree or dive into the brush… As soon as the machine guns opened fire on me, I began to exchange shots with them. There were over thirty of them in continuous action, and all I could do was touch the Germans off just as fast as I could. I was sharp shooting… All the time I kept yelling at them to come down. I didn't want to kill any more than I had to. But it was they or I. And I was giving them the best I had. One of York’s prisoners, German first lieutenant Paul Jürgen Vollmer of 1st Battalion, 120th Württemberg Landwehr Regiment, emptied his pistol trying to kill York while he was contending with the machine guns. Failing to injure York, and seeing his mounting losses, he offered to surrender the unit to York. By the end of the engagement, York and his seven men marched 132 German prisoners back to the American lines. His actions silenced the German machine guns and were responsible for enabling the 328th Infantry Regiment to renew the offensive to capture the Decauville Railroad. York was awarded the Distinguished Service Cross for his heroism, but this was upgraded to the Medal of Honor, which was presented to York by the commanding general of the American Expeditionary Force, General John J. Pershing. The French Republic awarded him the Croix de Guerre and Legion of Honor. Italy and Montenegro awarded him the Croce di Guerra and War Medal, respectively. York was a corporal during the action. His promotion to sergeant was part of the honor for his valor. Of his deeds York said to his division commander, General Duncan, in 1919: "A higher power than man power guided and watched over me and told me what to do." York was singled out as the greatest individual soldier of the war and when he returned home in May of 1919 he was wooed by Hollywood, Broadway, and various advertisers who wanted his endorsement of their products. York was taken aback by the New York City parade and prevailed upon Tennessee Congressman and future Secretary of State, Cordell Hull, to facilitate a hasty return to his home. Once back in Tennessee the Rotary Club of Nashville in conjunction with other Tennessee clubs wanted to present York with a home and a farm. Unfortunately not enough money was raised and they gave him an unfinished home and saddled him with a healthy mortgage. On June 7, 1919, York married Gracie Williams. They had seven children. Although York is best known for earning the Medal of Honor, he wanted to be remembered for what he did after he returned from war. York's grandson, retired Army Col. Gerald York said of York, "He wanted to be remembered as a man of peace rather than a man of war, and for his belief in God." York, who had only an elementary school-level education, leveraged his wartime fame to raise funds for a high school in his native Tennessee. In 1927, York felt led to further help out by building schools. He helped finance this work by going on lectures. However, debt piled up and his health began to fail. He had raised about $10,000 in the school fund. York originally wanted to create several small schools strategically placed in the mountains, but found the goal to be unrealistic. It was decided that instead of several small schools, one school should be created. In 1937, it was suggested that the school no longer be private, but state run. York liked the idea, and it was carried through. The school, now known as Alvin C. York Institute, is the only fully state-funded public high school in the State of Tennessee. The school is a nationally recognized school of excellence and boasts the highest high school graduation percentage in the state. It is home to almost 800 students. York also later tried to create a Bible school, but a lack of funds and poor health prevented it from being accomplished. In the 1920s, York became interested in state and national politics. A Democrat in a staunchly Republican county, York's endorsement carried a degree of clout. He used his celebrity to improve roads, employment, and education in his home county. In 1935 York delivered a sermon entitled, Christian Cure for Strife, which argued that the vigilant Christian should ignore current world events, because Europe stood poised on the brink of another war and Americans should avoid it at all costs. He preached that in order to achieve world peace, Americans must first secure it at home beginning with their own families. The church and the home, therefore, represented the cornerstones of world peace. The threat of war rekindled the interest of some filmmakers, most notably Jesse L. Lasky, into reviving the story of York's exploits during World War I. Lasky, having witnessed the famous New York reception of the hero from his eighth floor office window had wanted then to tell York's story. While several other studios found interest in York's saga in 1919, only Lasky had persistently pursued him. In the late 1930s, the world once again appeared on the verge of war and the official stance of the United States government was reminiscent of York's initial attitude toward the first World War. America (in 1939) and York (in 1917) both had to be convinced that war was not only justifiable, but sometimes necessary. When York at last relented, he announced that the film would "be a true picture of my life…my contributions since the war. It won't be a war picture. I don't like war pictures." However, the film turned out to be a war picture. The original screenplay presented the war as an epiphany for York which forced him to recognize his own inadequacies but fulfilled his wish to improve himself and his homeland. York's heartfelt belief that war represented moral evil never wavered before his association with Lasky and the Warner Brothers. In 1937, York not only condemned war but also questioned America's involvement in the First World War. In that same year, York joined the Emergency Peace Campaign, which lobbied against any U.S. involvement in the growing tensions in Europe. His personal struggle in World War I found new resonance in an America at odds over the recent European war, for York personified isolationist Christian America wrestling with its conscience over whether or not to engage in the current war abroad. As the film progressed the focus of the project changed and York's war exploit gained prominence. Through York's association with Lasky and Warner Brothers, he became convinced that Hitler represented the personification of evil in the world and turned belligerent. York's conversion to interventionism was so complete that he wholeheartedly agreed with General George C. Marshall that the U.S. should institute its first peacetime draft. Governor Prentice Cooper approved York's endorsement by naming him chief executive of the Fentress County Draft Board, and appointed him to the Tennessee Preparedness Committee to help prepare for wartime. During World War II he attempted to re-enlist in the Infantry but was denied due to age. Instead he went on bond tours and made personal appearances to support the war effort. He convinced the state of the need for a reserve force at home and was active in the creation of the Tennessee State Guard in 1941, in which he served as a Colonel and Commanding Officer of the 7th Infantry Regiment. York's health began to deteriorate after the war and in 1954 he suffered from a stroke that would leave him bedridden for the remainder of his life. In 1951, the Internal Revenue Service accused York of tax evasion regarding profits earned from the movie. Unfortunately, York was practically destitute in 1951. He spent the next ten years fighting with the IRS, which led Speaker of the House Sam Rayburn and Congressman Joe L. Evins to establish the York Relief Fund to help cancel the debt. In 1961, President John F. Kennedy ordered that the matter be resolved and considered the IRS's actions in the case to be a national disgrace. The relief fund paid the IRS $100,000 and placed $30,000 in trust to be used in the family's best interest. York died at the Veterans Hospital in Nashville, Tennessee, on September 2, 1964, of a cerebral hemorrhage and was buried at the Wolf River Cemetery in Pall Mall. The Alvin C. York Institute was founded as a private agricultural high school in 1926 by Alvin York and residents of Fentress County, the school became public in 1937 due to the Great Depression and continues to serve as Jamestown's high school. In 1941, York's story was told in the movie Sergeant York, with Gary Cooper in the title role. York refused to authorize a film version of his life story unless he received a contractual guarantee that Cooper would be the actor to portray him. Cooper won the Academy Award for Best Actor. York Avenue in New York City, on the Upper East Side of Manhattan, was named for the Sergeant in 1928. On May 5, 2000, the U.S. Postal Service Distinguished Soldiers stamps were issued and York was honored. The Laura Cantrell song "Old Downtown" mentions York in depth. During the funeral procession of President Ronald Reagan, the riderless horse in the funeral procession was named Sergeant York. Inauguration of Trail and Monument on October 4, 2008, in the Argonne forest. The Sergeant York Historic Trail was constructed in the Argonne forest. The dedication and ribbon cutting ceremony took place on October 4, 2008. The same day a memorial tablet was dedicated on the side of a hill in the forest near Châtel-Chéhéry. The Sergeant Alvin C. York Statue by sculptor Felix de Weldon was placed on the grounds of the Tennessee State Capitol in 1968. The Alvin C. York Memorial depicts a modest bronze helmet atop a stone flag on the grounds of East Tennessee State University in Johnson City, Tennessee. A poem on this monument is dedicated to York. The Alvin C. York Veterans Hospital is located in Murfreesboro, Tennessee. ↑ 1.0 1.1 1.2 Sgt. York Discovery, Discover the Testimony of Sergeant York, Retrieved January 10, 2009. ↑ York, Sergeant York: His Own Life Story and War Diary (1928). ↑ "The SYDE Story," The Sergeant York Discovery Expedition. ↑ History Net, Alvin York and the Meuse-Argonne Offensive. Retrieved January 10, 2009. ↑ 5.0 5.1 5.2 5.3 5.4 World War I, Sergeant Alvin York. Retrieved January 10, 2009. ↑ Army Mil, Allies conduct ceremonies to honor U.S. World War I hero Sgt. Alvin York. Retrieved January 10, 2009. ↑ Judith Bronte, Alvin York: In the Lion's Den. Retrieved January 10, 2009. ↑ "Alvin Collum York," Find-A-Grave. ↑ New York Times, The Great Race—"A Tennesseean Honored." Retrieved January 27, 2009. ↑ Matador Records, Laura Cantrell Biography. Retrieved January 27, 2009. ↑ Find Articles, A proud performer after all, The Sporting News. Retrieved January 27, 2009. ↑ The All State, The New Sergeant York Trophy Series. Retrieved January 27, 2009. Cowan, Sam K. 2008. Sergeant York and his People. Whitefish, MT: Kessinger Pub. OCLC 256949397. Lee, David D. 1985. Sergeant York: An American Hero. Lexington, KY: University Press of Kentucky. ISBN 0813115175. Perry, John. 1997. Sgt. York: His Life, Legend & Legacy: The Remarkable Untold Story of Sergeant Alvin C. York. Nashville, TN: Broadman & Holman. ISBN 0805460748. York, Alvin Cullum, and Thomas John Skeyhill. 1928. Sergeant York, His Own Life Story and War Diary. Garden City, NY: Doubleday, Doran and Company, Inc. OCLC 28358196. Sergeant York Patriotic Foundation Sgtyork.org. The Diary of Alvin York Acacia.pair.com. Allies conduct ceremonies to honor U.S. World War I hero Sgt. Alvin York Army.mil. Birdwell, Dr. Michael. Sergeant Alvin York Worldwar1.com. Williams, Gladys. Alvin C. York Web.archive.org. Army Officer: Sgt. York Battle Site Located Cbn.com. Do cartridges mark the spot of York’s heroics? Msnbc.msn.com. The Sergeant York Discovery Expedition Sgtyorkdiscovery.com. Alvin York and the Meuse-Argonne Offensive Historynet.com. This page was last modified on 16 November 2016, at 17:00.